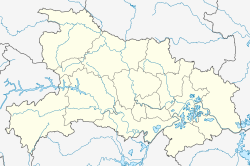 Qichun County (simplified Chinese: 蕲春县; traditional Chinese: 蘄春縣; pinyin: Qíchūn Xiàn)) is a county of eastern Hubei province, People's Republic of China. It is under the administration of Huanggang City. Qichun is the birthplace of famous herbalist Li Shizhen, who was born and lived in Qizhou town, on the southern edge of the county, alongside the Yangtze River. In turn, Qichun is a major center of the herbal industry in China. Qichun County is known in China as the "County of Scholars" because more professors (400+) and doctors were born there than in any other county of China. The town of Qichun consists of Qichun proper, and Caohe precinct. Inkstone with three legs and a bird cover. Eastern Han Dynasty. Excavated at Ganyuzui tomb, Qichun. In 224 BC, the Qin forces pursued the retreating Chu forces to Qinan (蕲南; northwest of present-day Qichun in Hubei) and Xiang Yan was either killed in the action or committed suicide following his defeat. The earliest known founding of Qichun was in 201 BC. Due to its strategic location, in history Qichun was referred to as “The Key Point of Jingchu” (Jingchu is another name of the ancient state of Chu). Centuries later, in the summer of 223 AD in the Three Kingdoms period, Eastern Wu general He Qi attacked and eliminated an outpost of Wei in the new commandery territory of Qichun, on the southern slopes of the Dabie Shan mountains. But for the next twelve months the northern front remained quiet. The Grand Administrator of Qichun was Jin Zong, a former officer of Sun Quan who had deserted and joined Cao Wei. It appears he was given the commandery appointment at this time, in the hill country of the Dabie Shan on the border region between Lujiang and Jiangxia, so that he could disturb the communications routes along the Yangtze and across that river to the south. There is evidence that the Qichun commandery had been established a few years earlier, evidently on the basis of the county of that name in Jiangxia commandery of Later Han, but the territory had been abandoned by Cao Cao at the time of his withdrawal in 213 AD. From this time, after the defeat of Jin Zong's infiltration, the territory was held by Wu. One of the subordinate commanders in He Qi's attack on Qichun was Mi Fang, the erstwhile officer of Guan Yu who had surrendered Jiangling to Lü Meng in 219 AD. Qichun also was evidently a proving ground for renegades. The total geographic area of Qichun County is 2,400 square kilometres (930 sq mi). Of this, 560 kilometres (350 mi) are arable. Water covers 310 kilometres (190 mi) (there are hundreds of lakes in Qichun County, almost all used for aquaculture). Forested areas cover 1,040 kilometres (650 mi). (Note: While not stated in government data, unless there is a statistical error, the remaining 490 square kilometres (190 sq mi) must be hills/mountains, in the northern part of the County, or simply unusable land). Qichun County Map (as of 2006), showing precinct names in Pinyin. The local climate is classed as "subtropical mainland monsoon," with distinct seasons and abundant rainfall (average 134 centimeters per year). When the Yangtze River floods, Qichun County also experiences some flooding. Total County population was 949,700 at the last census. Qichun Town's population was 162,000, of whom 71,000 were engaged in agriculture (fisheries, crops, and herbs are the main agricultural sectors) and the remainder non-agriculture (which includes minerals and manufacturing of various kinds). About 40% of all the farmers of Qichun County are engaged in growing herbs. The County has produced hundreds of scholars and doctors and is known as "The County of Scholars." Perhaps not surprisingly, the local character is considered "refined." Hubei people are known as (and refer to themselves as) "9-headed birds." This is meant as a compliment: they are both talkative and clever (9 mouths yacking; 9 brains thinking). Hubei people are said to be "square and sturdy" (that is, healthy, strong, and square-and-sturdy in appearance). In addition to the famous herbalist Li Shizhen, another Qichun scholar from ancient times was Gu Jingxing (1621–1687), a prolific author of hundreds of books, and an Imperial scholar from a long hereditary line of scholars going back several generations of the Gu family. Yu Xiaozhong (余笑忠) (born 1965) poet. The town of Qichun is in the Caohe precinct of Qichun County, the towns of Qichun and Caohe essentially having amalgamated geographically. Qichun town is the "county seat", as it were, of Qichun County. The government buildings for the County and the Town are adjacent to each other, and are just across the street from the relatively new Qichun Hotel (below). There is only one hotel of any significance in Qichun. But it is a new hotel, built around 2001. Qichun is reasonably well-served by rail, bus, and road transportation; there is no airport. The main Beijing to Guangzhou rail line passes through Qichun, and there are local trains, west to the Hubei provincial capital of Wuhan and south-east into Jiangxi province. There is a local bus service and also frequent express buses into Wuhan via the new inter-provincial expressway running east-west across the province. A journey by express bus to Wuhan takes less than three hours; by car the journey is less than 2.5 hours. Local roads (including that into town from the expressway) are rough and full of pot holes. However, downtown streets are well paved with good sidewalks. There are few cars thus far in Qichun, but many motorbikes. Taxis are of the 3-wheel motorbike-with-cab type. The herbal industry, centered on Qizhou, is the biggest component of the Qichun County economy. Some 200,000 herb farmers live in Qichun County. They produce more than 700 varieties. The local herb wholesale market is the third largest in China, with more than 800 million yuan (US$100 million, as of 2006) of annual trading volume. Qichun Social Welfare Institute, new building, 2005, with old building (white) behind it on the right. Qichun County has its own Social Welfare Institute (SWI) to accommodate elderly people, handicapped persons, the homeless, and orphans. The Social Welfare Institute constructed a new building in 2004, designed mainly for the elderly and handicapped children and adults. Children which are abandoned or orphaned, and are awaiting adoption either domestically or internationally, are placed with local foster families. But they visit the SWI weekly for medical checks and group playtime activities. About 400 orphans have been adopted internationally from Qichun County SWI. These children now live with families all over the world: in Canada and the U.S.A., in Australasia, and in most countries of Western Europe. ^ 中国地质邮政编码簿(2015). China Post. 2015. p. 595. Wikimedia Commons has media related to Qichun.